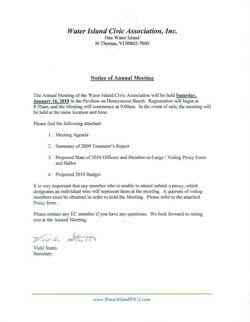 NOTE: The first page you will see is the Notice of the Annual Meeting. There is a typo that says the date of the meeting is January 22, 2010. We might be good but we cannot turn back time. The date, of course, is January 22, 2011. If you will not be attending the Annual WICA Meeting on Saturday January 22, 2011, please send in your voting proxy below. If you do not identify whom you want to receive your proxy it will be given to a random member in attendance. Thank you!